Teachers, librarians, parents and other educators: Check out our latest digital kit, focusing on fiction and nonfiction book pairings, as well as plenty of tools for how to use nonfiction in general. This kit has virtually everything you need to maximize your use of this awesome format in your public library, school library, classroom or home. Free music to stream or download to keep. After more than 25 years of life in a tank, Spike the Library Turtle has finally decided to see some of the world – starting with Stow and Munroe Falls. Spike has a new job. As library ambassador, she has been given the task to see what there is to see in this community and strengthen the library’s relationship the citizens of Stow and Munroe Falls. Miss Kristin and Miss Amy from the children’s department will follow Spike around and document her travels for you to watch. Check our Web site periodically to see short movies of where Spike has been, who she meets and what kinds of things she gets herself into in Stow and Munroe Falls. Spike may even venture beyond this community. Stay tuned! Click Here for More Great Movies from the SMFPL Kids channel! View photos as a slideshow. A sunny evening and more than thirty pets made this year's Pet Show a great success! Participants included a bearded dragon, a chinchilla, a colorful, orange corn snake, and several breeds of cats; along with many pugs, labs, boxers and other dogs. Thank you to everyone who participated. It was a lot of fun! 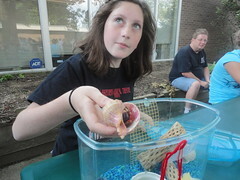 A sunny evening and more than forty pets made this year's Pet Show a great success. Participants included a bearded dragon, a chinchilla, a colorful, orange corn snake, and several breeds of cats; along with many pugs, labs, boxers and other dogs. Thank you to everyone who participated. It was a lot of fun! Click on the photo to see more photos. Spike Passes are handed out starting a half hour before an event. They are given on a first come, first served basis. You will not have to pre-register for these events. When we run out of Spike Passes, the event's seating is full. Education meets entertainment with an all-in-one video player. Your kids' favorite videos come pre-loaded and ready to go wherever you go!